King and Queen. Emperor and Empress. Czar and Czarina. Sultan and Sultana. Lord and Lady. Prince and Princess. Baron Von Whatever-you like and Baroness What's-her-face. There's lots of positions of power out there. Please interpret that as: "There's lots of reasons to wear a crown out there." Because there are. All of these positions require some kind of symbol of Authority. And what better way to show status than a ring of precious metal and jewels atop your head? Now, of course there are more reasons to wear the crown than being a ruler. You've got Masters of the Burgers, Dukes of the Drinking Games, Princess of the Birthday, and of course you could always just wear a crown if you want to. So here you are! 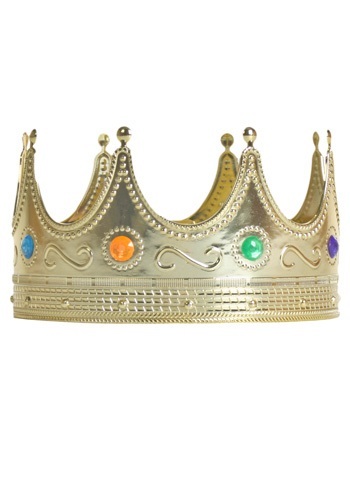 A Royal Jeweled Crown for all of your sovereign needs (or for any other reasons you can think of)! it looks big for my head but better too big than too small right? Has Styrofoam lining so it was a great fit for me and/or my husband. Good quality too.